¶ 4 Leave a comment on paragraph 4 0 Memorials and monuments reflect more about the time when they are built than about the past events and people represented. Regional preservation groups such as the Association for the Preservation of Virginia Antiquities (APVA) erected memorials and preserved sites tied to Virginia’s founding families that recast British settlements at Jamestown and Williamsburg as harmonious and homogeneous. For elite Virginian members of the APVA, post-Civil War political and cultural upheaval left them with a present they did not like. Preservation and reconstruction efforts let them –and other groups working in different states—return to time when white elites commanded power and deference from blacks and poor whites. ¶ 6 Leave a comment on paragraph 6 0 Colonial-themed stamps from the 1920s and 1930s coincided with growing interest in viewing, owning, and displaying physical evidence, or material culture, from colonial and early Republic eras. Wealthy businessmen and heiresses of industrial fortunes donated money to finance wings in museums and historic preservation. The American Wing at the Metropolitan Museum of Art opened in 1924 to exhibit early American decorative arts and furnishings of “our ancestors” – where “our ancestors” meant a few selected to represent the many. Philadelphia’s Sesquicentennial Exposition boasted “High Street,” an attraction that featured rebuilt “colonial” structures of Philadelphia in 1776. Inspired by Henry Mercer’s collections of tools, Henry Ford began voraciously collecting a host of buildings and objects in 1919—anything from agricultural machinery to household and kitchen implements—that he would eventually display in Greenfield Village, Michigan. Uninterested in financing an established historic site like John D. Rockefeller, Ford created his own emulation of an “Early American Village” that opened to the public in 1931. Physical restorations and quests for “authenticity” at Colonial Williamsburg in the late 1920s and early 1930s encouraged some Americans to purchase antiques and replicas to decorate their homes.5 Calling upon the designs of the late colonial and early Republic periods during a time of American post-war conservatism in foreign policy, some Americans focused on building the image of United States as an exceptional place with a unique history. 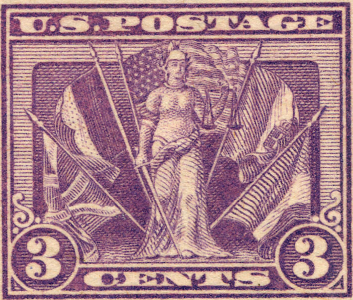 ¶ 7 Leave a comment on paragraph 7 0 This chapter will reveal how different groups reached backwards to use images and individuals from the past to address cultural and political unease with 1920s and 1930s America through the medium of a commemorative stamp.